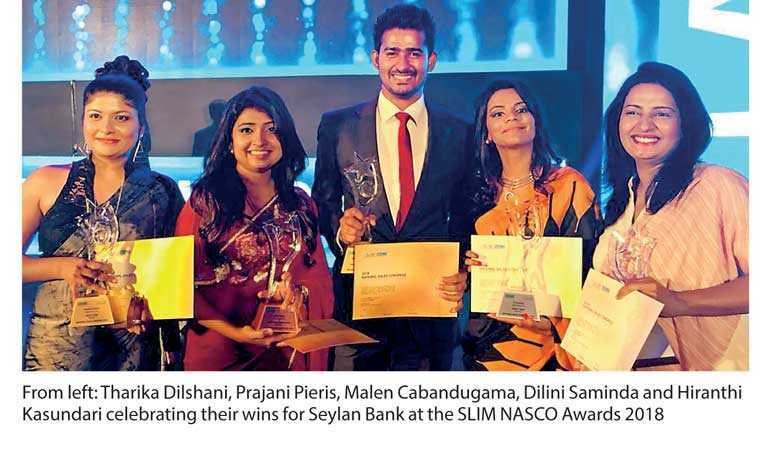 Seylan Bank’s young sales force was bestowed with five awards at the recently concluded SLIM NASCO Awards 2018. The two year old sales team brought in two Golds, two Silvers and one Bronze underFront Liners, Sales Executives and Sales Support categories respectively. During the ceremony the Banking Industry Front Liner Gold was awarded to TharikaDilshani (Credit Card Sales), while DiliniSaminda (Personal Loan Sales Team) was awarded Silver. MalenCabandugama (Housing Loan Sales) won Goldwhilst PrajaniPeiris (Personal Loan Sales) broughthome the Bronze under the Sales Executive category.HiranthiKasundariwas awarded Silver under theExecutive Sales other staff categorywhich was introduced as a new category this year. Earlier this year Seylan Bank bagged five awards at theGolden Globe Tigers Awards 2018 Sri Lanka Edition. In addition, the Bank with its 30 year completion is relooking at its processors and technologies to offer the best in class services to its customers. This year’s SLIM NASCO witnessed the crowning of sales champions from 22 industries in Sri Lanka. The award ceremony annually rewards high preforming individuals for their efforts and achievements in the sales fraternity and provide national level recognition.